Hi Andrew, thank you so much for the lovely review. We are happy to hear you enjoyed your stay and hope to see you again soon. Hi Sally thank you for that amazing review and we're delighted you enjoyed breakfast. Hi John, thanks for the kind review, we look forward to seeing you again next time. Hi Stephanie, thank you for the kind review, we're delighted you have enjoyed your stay with us. Perfect for us country folk. Easy to find. Ideally situated around our family. Easy walking distance from shops. Thank you for the lovely review Jenine and Kevin, we're delighted you enjoyed your stay. This is an older style motel, BUT the rooms are huge and comfortable and immaculately clean. Thank you for the lovely review Jenine, we look forward to your next stay with us. Hi Francis, fantastic to hear that you enjoyed your stay. If we can improve on anything feel free to let us know. Thanks for the review Nandi, we look forward to your next visit. We really enjoyed our stay at St Georges, and we will definitely be returning. Clean, spacious room with good heating for cold Melbourne winter night. Friendly, helpful service. Great value for money. Thanks for the kind feedback, we're glad you enjoyed your stay. Rooms are super clean. I've stayed in 5 star which aren't as clean as these rooms. This is my second stay at this place and I'll definitely be coming back. Many thanks. No issues. Michael at the front desk was very friendly and helpful with suggestions. Good shower, decent TV, WiFi. Thanks Craig. The Team are always happy to offer a suggestion and help out with any information we can to make our guests stay comfortable. We are always looking to improve our facilities and believe that great WiFi and a hot shower are a must for any traveler. 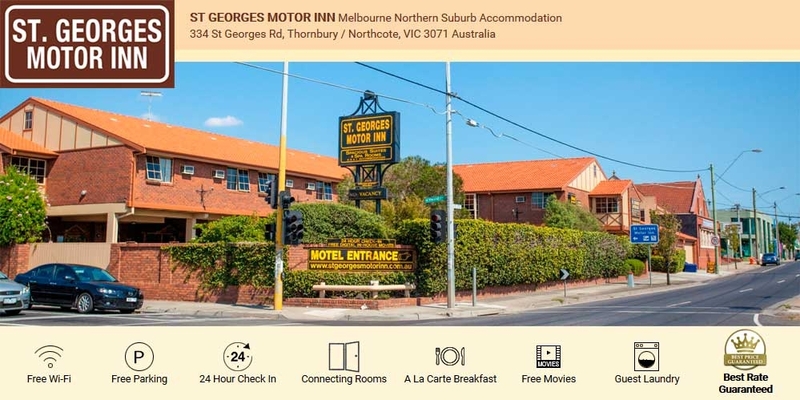 St Georges Motor Inn is a great value for money place of accommodation right opposite the route 11 tram line into the city. Staff very friendly; rooms comfortable and clean. Will always use this place when in Melbourne and recommend to family and friends. Thanks Michael for your kind review. The moment we checked in Michael was very lovely, he upgraded us from a budget double room to a standard queen room. Even after I accidentally broke a glass, he immediately replaced it for me with a smile. The room was very clean, comfortable and very quiet, which is what we needed. The location is excellent, as we needed to attend the Austin hospital in the early morning. And they have KFC, Subway and a Pizza shop walking distance from the Inn. Also the tram is walking distance. All in all I would highly recommend a visit to St Georges Motor Inn. thanks guys for the great review Michael David. Great service with a smile! Thank you! 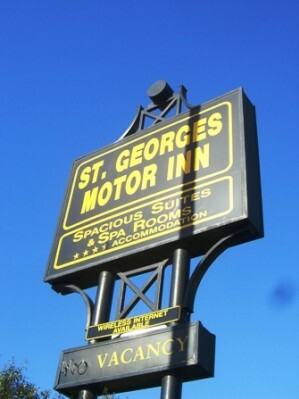 Our experience at St Georges Motor Inn is excellent. Friendly staff, perfect location and very clean. Thank you. I was pleasantly surprised by the quality of the hotel, for a budget room - it was immaculate and comfortable. Great stay as always, convenient location and helpful friendly staff and awesome cleaners! Hi John, thank you for the kind review, we're glad you enjoyed your stay and look forward to the next time you come visit family. our booking was for 3 nights in a standard room. We were allocated room 25, and this room had a few issues: old and very noisy air-conditioner, shower head that was hard to regulate and difficult to use and room was located on a noisy side of the building. I brought this to the attention of the staff after our first night and was very impressed with their response and the way in which they handled my feedback. We were moved to another room as soon as one became available and we received an "upgrade" which was totally unexpected, but very much appreciated. I think this motel represents good value for money and the service we received was excellent. It is also well located and we will definitely book in again next time we visit Melbourne. Hi Mary thank you the lovely review, please visit again soon. David.. very helpful efficient and friendly . Hi Shirley, thank you for the wonderful review, we look forward to having you stay with us again. Hi Donna, thank you staying with us again, if there's anything we can improve do let us know. Staff very friendly and helpful. Was a good location for what we wanted to do. Would definitely stay there again. Hi Christine, thank you for the lovely review. If there's anything else we can improve on please do let us know. We look forward to your next visit. Overall it was a good experience but all the pillows need replacing as its like sleeping with no pillow. They are super thin and have had theyre day ! Hi James, thank you for your kind review and helpful feedback. We have just finished replacing all the pillows and linen today, and had been slowly doing so in all the rooms the past few months. Hope to see you again so you can enjoy the new pillows! HiTeresa, thank you for the lovely review. Feel free to let us know where we can improve. Room was very clean, spacious and well serviced. Staff were very helpful. Tram stop across the road made travel to the city easy. Hi Jody, thank you for the great review. We appreciate the your time and hope to have you stay with us again. Kind regards, David. Personally I love staying at the inn. The rooms are not fitted with the latest designs in accommodation but I appreciate the old fashion inn style and the extra spacious rooms that gives me. The staff is extremely helpful, courteous and friendly. Suited my needs very well. Comfortable and relaxing place to stay. close to the city and transport. Hi Marilyne, thanks for your lovely review, if there's anything we can improve on, please let us know! We look forward to seeing you again soon. Thank you for your review Christine, we appreciate you taking the time to fill this in and we look forward to seeing you again in the future. excellent service, a bit noisy next to busy road which is to be expected. Breakfast prices a bit high. Only fast food restaurants nearby. Good place to stay for a much cheaper price than city hotels. Room very clean except for nasty carpet stains. Hi Kerry thanks for taking to provide us with your lovely and helpful feedback. That room is having its carpets in the next week, so it will definitely be even nicer next time! Also, there are many well-known and popular restaurants on High St, which is just a short walk from our motel. Lastly, our breakfast prices are on par if not lower than many of the restaurants nearby, however, if you would like breakfast in the future we can also do set prices. We look forward to seeing you again in the future.